this page is made to refresh your kitelesson with kite guide brazil. Not to replace them. Have fun with your next lesson and keep it safe! Watch out for rocks, trees, people and anything that your lines can get stuk behinned. Make sure you have sufficient distance from all the objects in front of you. (3 times your own line length) and sufficient distance of objects next to you (2 times your own line length). You must make sure that there are no buildings or mountains that make the wind turbulent behind you. - Lines behind the kite. - Make sure your bridle isn't tangled. - check your safety system. The wind window is the fundamental theory behind kiteboarding. Kites fly within the wind window, so you must learn how to manage the edge/neutral zone, the intermediate/soft zone, and the power zone. What is the wind window? How do kiteboarders use the wind window to speed up and change directions? Understanding the concept of the wind window is critical if you want to progress in the sport of kiteboarding. Basically, the wind window is the name given to the three-dimensional area downwind of the pilot that the kite can fly in. The length of the kite lines will determine the radius of that a particular wind window. So, the longer the line, the larger the radius of the wind window. That is why kiteboarders use the clock - from 9 to 3 o'clock - to get the exact location of the kite above the water. 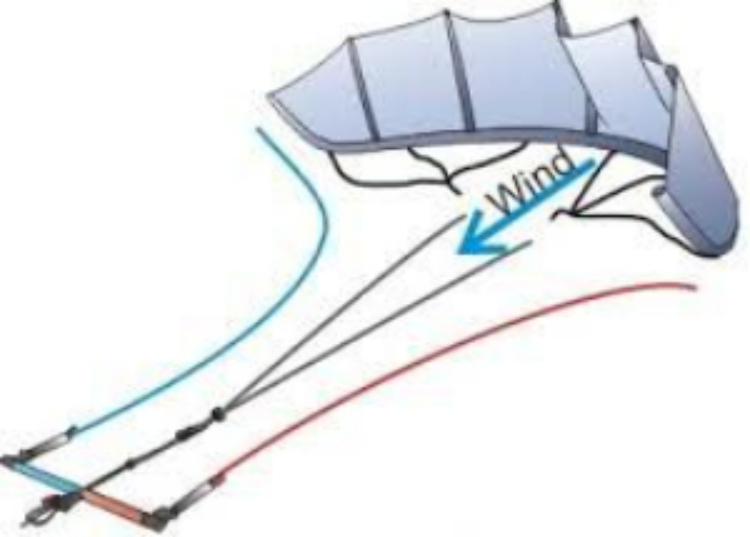 The three main zones of wind window will effectively impact the power of the kite. Mastering the intuitive technique of getting the kite where you want it to be will get you full control of the sport. 1. The Edge/Neutral Zone: in good winds, the kite can remain in stationary flight in this zone, producing little or no power. 2. 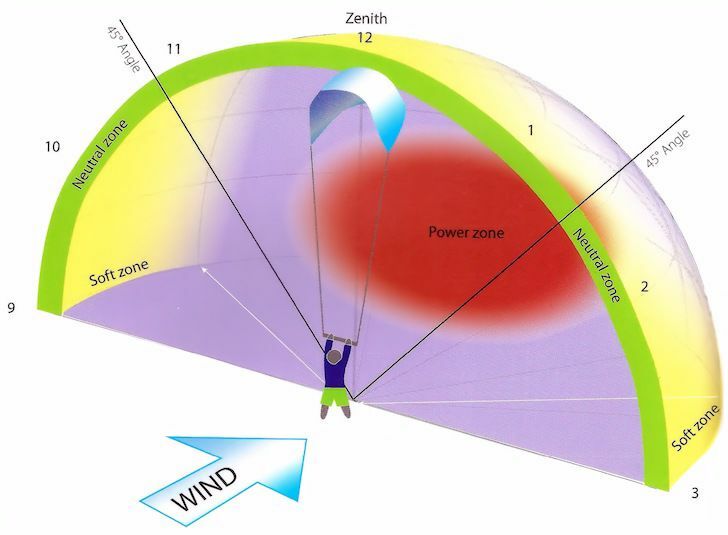 The Intermediate/Soft Zone: the area downwind of the neutral zone, where the kite starts to move dynamically and produces power; the power generated within the intermediate zone is gradual, increasing the closer it is to the center point of the window or power zone. 3. The Power Zone: the most powerful area within the wind window and is used with sensible control; this zone is rarely needed except in light winds and when performing advanced tricks; the kite cannot be paused or stopped in this zone and will continue to fly towards the neutral zone. If you're launching or landing a kite, you'll need to get it to the edge/neutral zone. A water start will require your kite to be in the power zone. You should not get your kite at 12 o'clock (Zenith) when at the beach. If you're looking for maximum speed, send your kite into the power zone at between 9h30 and 10 o'clock. But remember, don't get overpowered in strong winds or violent wind gust conditions. 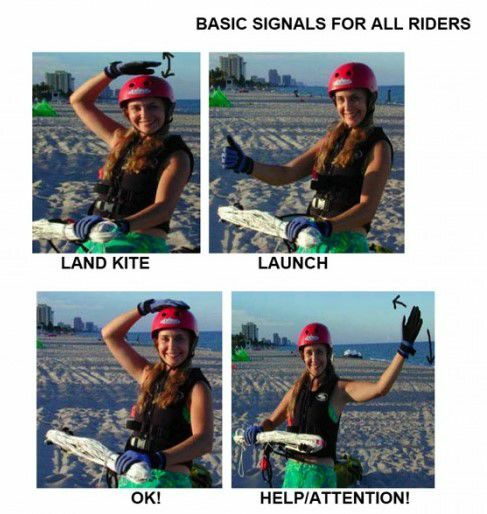 It is important that we recognize UNIVERSAL hand/audible signals for kiteboarding. They have these in diving and many other activities and they have been a help. In the case of kiteboarding effective signals can accomplish many things including reducing the odds of a launch/landing incident or accident, verifying that the person that is to catch your kite may indeed have some idea of how to do it, etc. If you exchange signals with someone it is more likely that they may know how to help you correctly. Guys have been severely injured several times by having untrained people help them and through miscommunication with experienced helpers. The correct way to launch and landing a kite will be one of the first skills you learn during your kiteboarding lessons. It's common for kiteboarders to crash their kites into the water and relaunching your kite is a basic skill that all kiteboarders need to know how to do. check out this video. Will help you understand the basic principles of the self rescue, and revises the steps involved to support your lessons. Hopefully, you can use this video to get the concept, which will give you more time to practice with your instructor. To make the footage as clear as possible this was shot on a clear day on a sand bank, on a large kite in around 15knots. In most situations you would be using this technique in deep water. I filmed a deep water version (which I will post some time), but it's not so easy to see what's happening with bar and lines and therefore not a good visual of the technique. You will find variations on the self rescue technique. Such as some people may wrap the excess safety line in figures of 8, or may use 5 line kites. However, the key principles stay the same. This technique of how to pack down your kite both in shallow and deep water. 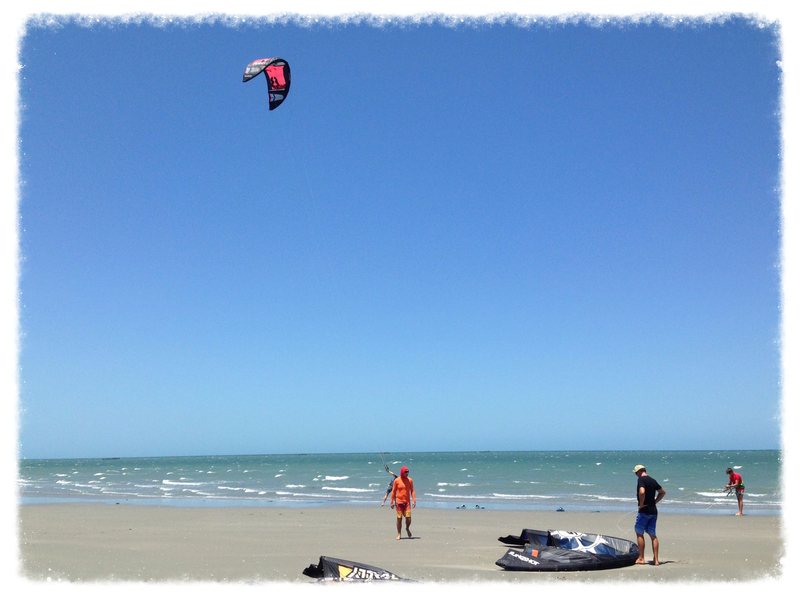 Kiteboarding is a practical sport where lessons are essential. It cannot be learned solely in a book, through a video, on a simulator or taught by a friend. There are some fundamental principles that need to be mastered in a structured order to avoid issues with your equipment impacting on other people or yourself. check out this video how it's done. 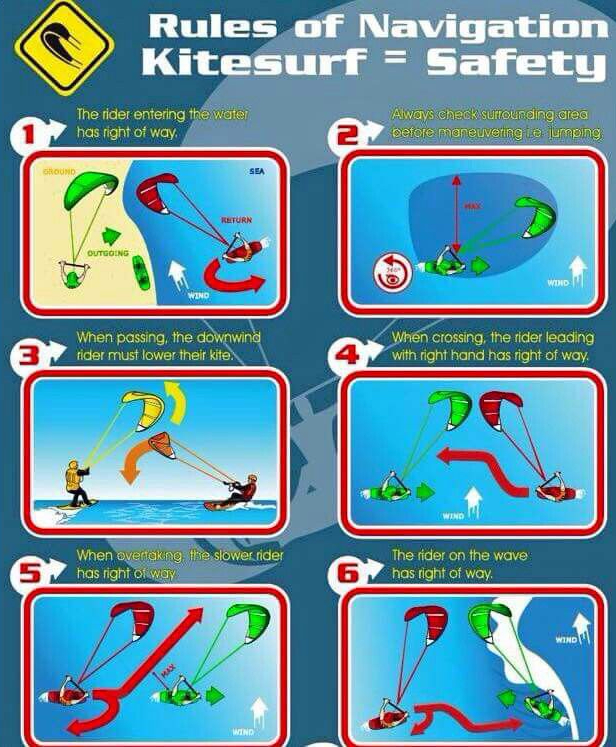 To make the sport safe all kiters must live to the same rules. pleas make sure you know them and remember the fact thed beginners do not know these rules so stay away from them and give them some time to learn. body dragging is one of the most important techniques you should master in kiteboarding. It will allow you to recover the board and, in extreme cases, it might save your life, too. Kiteboarding beginners must learn how to body drag themselves back to the beach if an emergency occurs. In the early rides, it's easy to lose a board. A wipeout, a rip current, or crash might also compromise your board, so you need to be ready to get back to your board. You will effectively drag your body across the water by making smooth sinusoidal lines with your kites. The more radical the figure eight, the fastest you'll move. Remember that the kite should never fly to the opposite wind window. It is also important to note, that body dragging can be quite tiring, especially if done for long periods of time. So, if your arms need a rest, get the kite at 12 o'clock and relax while floating on your back. In all cases - slow and fast body dragging - try to keep your hands well centered on the kite bar to avoid miss-steering the kite in choppy waters. Upwind body dragging is a key technique for retrieving kiteboards. It can also be used to reach the shore in upwind sailing conditions. Make sure to power the kite slightly, to keep it at 45 degrees, and as stationary as possible. Downwind body dragging is slightly easier, but you should never underestimate the power of the wind. Sudden gusts can rapidly blow your hands off the kite bar. Kite steering in a downwind is relatively effortless. Practice your first body dragging experimentations when the winds are light, and make sure you never ride a kite alone. Check out this video link to see how it's done. A water start is the critical skill to learn when you have mastered controlling your kite and body dragging. This will be your first real taste of kitesurfing. Turn your kite in your direction of travel and dive it forward. The deeper you dive the kite the more power it generates. Start with a short dive so that you are underpowered - you will get lifted out of the water then fall backward. Avoid getting overpowered - which will pull you forward over your toes. Once confident with handling the diving kite, try a more powerful dive so that you get lifted right out of the water. Hang on to the bar as you get lifted out of the water and start planing downwind to gather board speed. If you are going too fast just PUSH OUT THE BAR. Straighten your front leg once the kite pulls you are out of the water. Let the board run downwind to get up some speed. Look where you want to go (not at your kite). This will get your body oriented in the right direction and assist with edging the board. Edge the board with your heels in your direction of travel. Lean back a bit to avoid getting pulled over your toes. Fly the kite back up after the dive, but not too high - if you continue the dive it will crash into the water. Keep the kite flying - by now you should be bringing it back down again to generate more power, or have it locked in position if there is good wind. Once you are up and going concentrate on balancing the power of the kite against the rail of the board. That's it. You are kitesurfing! If your board sinks you need more power and board speed. Keep your kite turning and don't let it get too high. Make sure you get enough board speed before edging the board. If your kite crashes into the water, start turning it back up earlier. This will become automatic eventually. Keep your knees bent when you start to lower your centre of gravity. In stronger winds you don't need to fly the kite down so hard, and you won't need to fly it up and down (sine wave). You will be able to fly it "locked in" at a convenient position. Avoid pointing the board too far upwind and/or choking the kite (bar in too much) - both will result in your kite losing power and you sinking back into the water. Heading straight downwind will also cause the kite to lose power - you counteract this by edging the board. If your location suits try a downwind run to get the feel of board speed and flying the kite. check out this video to see how it 's done. Wrapping Up the Bar, Lines and kite. Do this in a correct way to double your kite's life span. Check out this video to see how to wrap up your bar and lines. 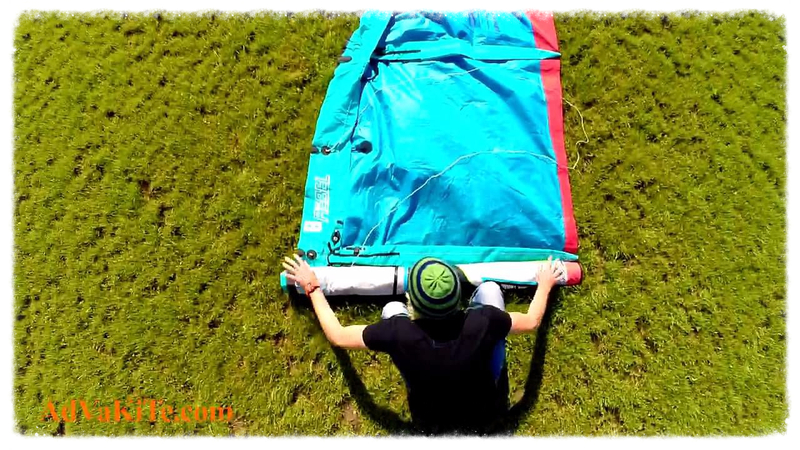 Check out this video to see how to wrap up your kite.